Arm, disarm or check your home automation system status from virtually anywhere. Connect and control your security, lighting, locks, thermostats, cameras and more remotely with the highly intelligent ADT mobile app. Your Devices are More Than Smart. In case a fire breaks out, set your system to turn off the thermostat to help stop the spread of smoke, turn the lights on, and unlock the doors for a safe escape. Put simplicity in your hands and unparalleled protection in your home. Compare our smart home automation system options below. Lock and unlock your doors from your smartphone for an extra level of security with ADT Automated locks and keypads. Control your lights from any location with ADT Automated Home Lighting and smart bulbs. Adjust and schedule your home’s temperature remotely with ADT Home Automation compatible thermostats. Open, close, and monitor your garage door from anywhere with ADT Home Automation garage door security. See, hear and speak to anyone at your door with ADT Home Automation compatible doorbell cameras. Transform electronics and appliances into devices you can control remotely with ADT Home Automation compatible plugs and switches. Add smart home automation to your ADT security system. 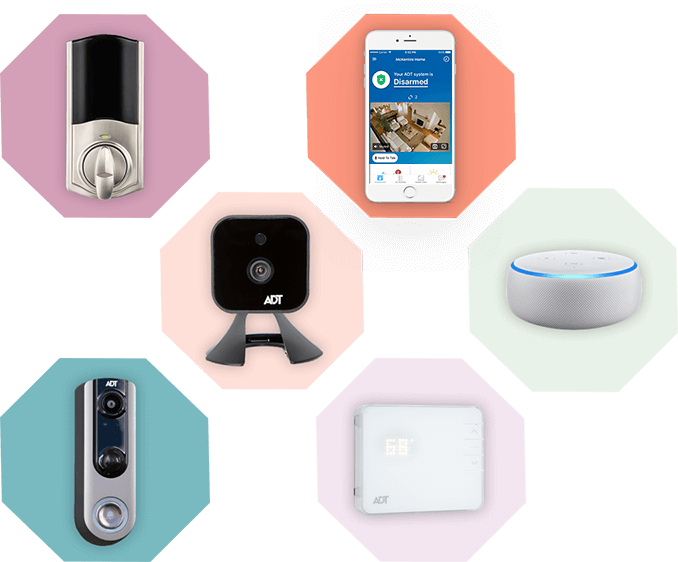 ADT uses Z-Wave wireless technology to connect your smart devices, and lets you control all of them from seamlessly integrated Interactive Services.